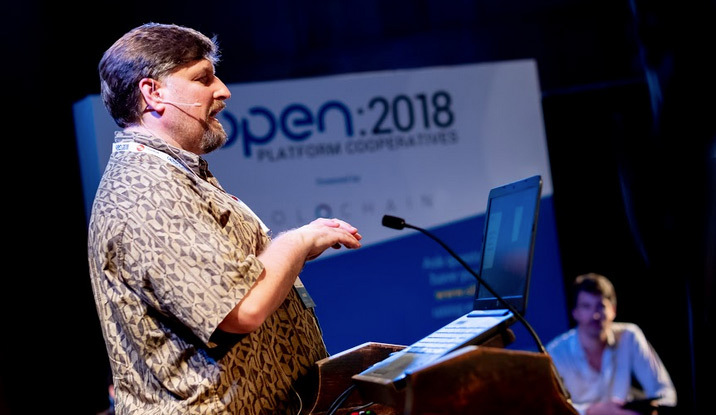 What happened at OPEN 2018? 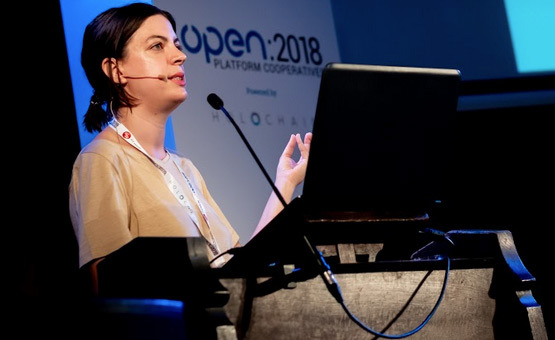 Lynne Davis, CEO of the Open Food Network UK, introduced their growing platform co-op and explained how they now share the cost, and responsibilities, of developing code across several federated organisations throughout Europe. Maru Bautista, Director of the Cooperative Development Program at the Center for Family Life in Brooklyn, New York, introduced Up&Go, the immigrant-led cleaning services worker cooperative in NY which, unlike regular capitalist platforms, delivers 95% of its income to its workers. 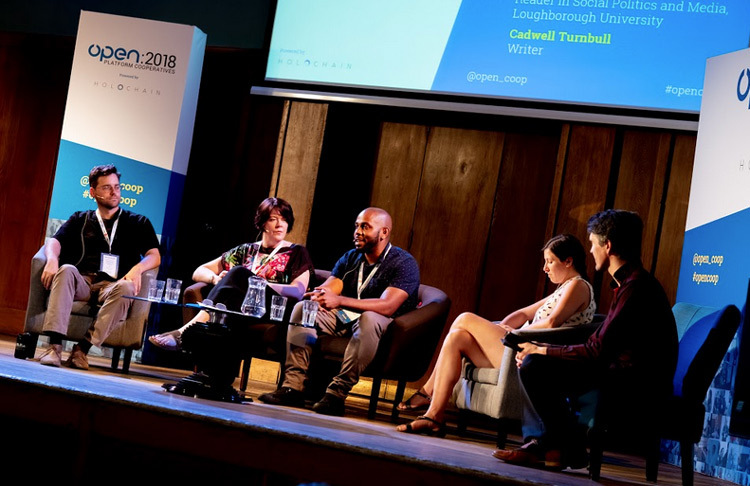 Peter Harris, the Founder of Resonate – the excellent music streaming co-op, explained how he might be their first CEO but also hopes to be the last, by putting the members in complete control. 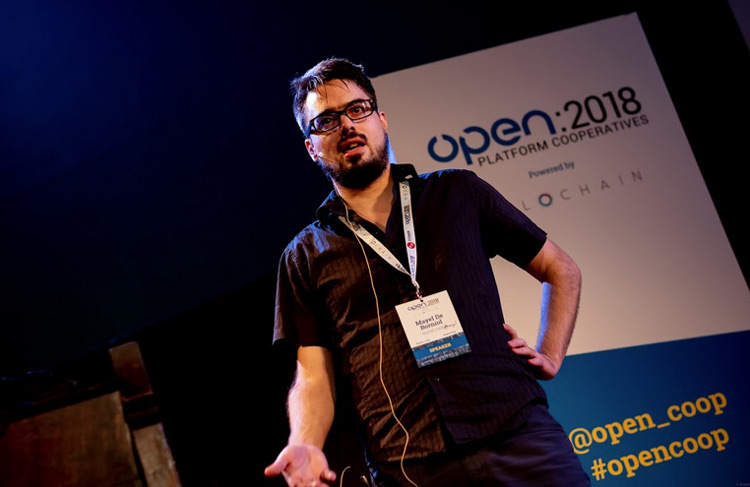 Alexandre Segura and Lison Noel from Co-op Cycle shared their inspirational journey to develop an open-source alternative to Deliveroo made up of a community of couriers in cities throughout France and Belgium. 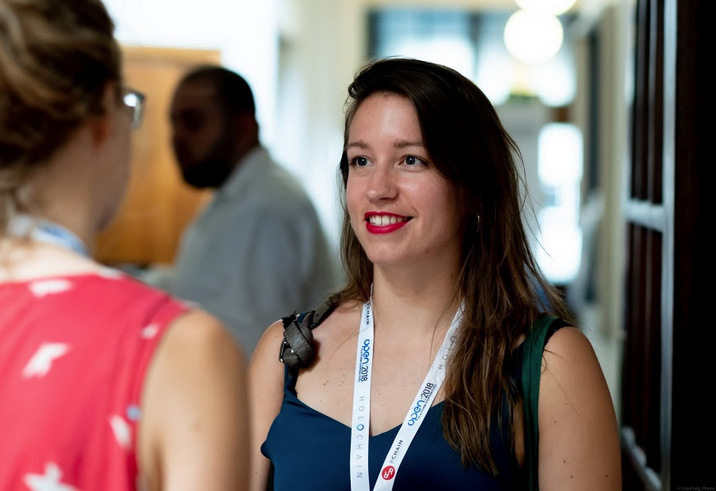 Aside from all the presentations on the Main stage, the workshop sessions and the open space gatherings the main benefit, that people who attended highlighted, were the connections that were made at the event. Our mission brings together so many people from inter-related fields and networks, who predominately work remotely or in distributed teams, so simply being in the same physical space initiated numerous face-to-face meetings between people that have communicated, planned, plotted and schemed, as well as worked together, online – but never met before – and a multitude of new connections and interactions. The 26th and 27th of July were some of the hottest days of 2018 in London, so a lot of interaction took place outside the venue. It may well have been cooler in Red Lion Square under the trees but there was widespread agreement at the event that we all need to do more to address global warming. 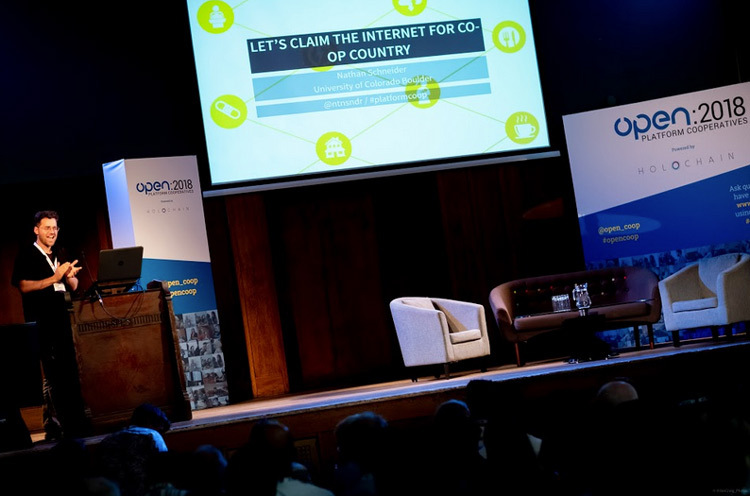 At events like this there is always talk of “setting up a new network” but, being wary of this, I brought up the ideas of Joshua Vial – Founder of Enspiral, who recently suggested that instead of founding new networks, we need to find ways to connect all the existing networks by developing more and better ambassadors to circulate ideas and updates. This came up in Francesca Pick‘s section of the Networking the Networks session, in which she introduced the idea of “ambassadoring” as a verb; something which all of us can do. We agreed it’s an ugly word, but an essential concept for the development of our movement. Ela Kagel, Co-founder of SUPERMARKT in Germany, Indra Adnan of The Alternative UK, and Ruth Potts from Schumacher College and Red Pepper, discussed the latest developments and outcomes from their work, CTRL Shift, Transition Together… and the general need for societal transitions and systems level change. 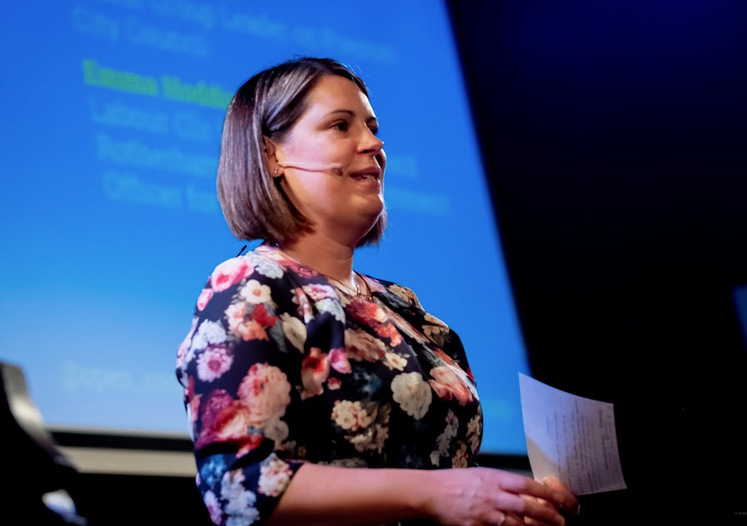 Alice Casey from Nesta, who work covers areas such as how technology is transforming communities and civic life, kept things on track in the workshop space, together with David Brent and Simon Borkin from Co-op UK – check out all the videos from the Workshop space and Open space. Rich and Nati from Loomio and The Hum ran an excellent workshop on Patterns for decentralised organising. Rich and Nati bringing the group back together after much discussion. At the end of Day One, (from left to right) Nathan Schneider, Cristina Flesher Fominaya, whose forthcoming book is about “Real” Democracy as expressed, demanded and manifested in Spain from 15-M to Podemos, Cadwell Turnbull, and Francesca Pick explored the transformative power of narrative in creating a world of abundance and inclusivity. If we want to change the way the world works, and address the inequalities and suffering from a systemic level, we can not build ideas and ‘further reasoning and arguments’ on an invalid axiom, and a broken ontology. We have to start afresh and build upon new foundations. Collaboration is not always built on a shared discursive framework, but might involve parties with very different world views and ways of communicating. Too true, we need to constantly be aware of that whilst we work on developing a more unifying world view, (possibly one based on the idea that ‘people and planet come before profit’?) in order to create the world we want. Another take-away for me was the concept that Cristina brought up a few times, which has been brought to light by both Manuela Carmena, the Mayor of Madrid who often reminded voters “To govern is to listen” during her campaign, and Ada Colau, the Mayor of Barcelona who both propose a more feminine politics. Both women have put forward the idea that “politics is about caring” which is not only a far-cry from the male-dominated ideals of Westminster but, somewhat uniquely for a politician’s phrase, makes perfect sense. Everyone at OPEN 2018 seemed to agree; we need more of that. Louis Cousin from Cooperatives Europe, Laura James Co-founder at Digital Life Collective, Colm Massey from the Solidarity Economy Association, and Tom Ivey from domains.coop discussed mapping projects. This introductory session provided the overview of mapping objectives and the challenges many groups have already experienced when trying to “map the ecosystem”. The session continued in workshop space – see the video. We will continue to monitor and report on progress from the various mapping projects. 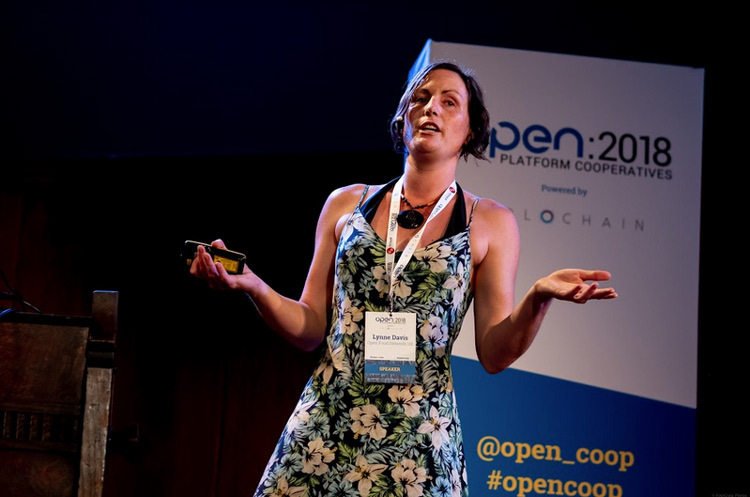 We introduced the Platform Co-op concept and were treated to presentations on the Open Food Network, Up&Go, Resonate and Coop Cycle, all of which demonstrated great progress through making members owners of their businesses. But a real ‘wake-up call’ for me was the seemingly unanimous agreement that we should be moving away from platforms in favour of shared protocols. This is an essential concept – and one that we have very possibly been slow to realise, as it is a subtle but significant difference. The basic premise is that, although platform co-ops are a step in the right direction, which make members owners and place them at the heart of decision making within commercial organisations, they limit progress by maintaining the role of the ‘middle-man’. By comparison and, more importantly in terms of a completely liberated peer to peer economy, open protocols connect different services and networks and enable truly distributed communication and collaboration at scale. Claire Tolan dumbed-down her inner-geek to explain how Rchain, (a cooperative building a blockchain platform and tools to enable social coordination in robust, secure, and scalable ways) works and relates to what they are building at Resonate. Mark Harding from Minds presenting their work on developing a new, open source, social networking platform. I put the question “should we be moving away from the idea of platforms, towards protocols instead?” to the panel of the Open source social networks, protocols and platforms session and was surprised to get a swift and resolute “Yes” from each of the participants; Claire Tolan from Rchain, Mark Harding from MINDS and Mayel de Borniol from Social.coop – which seemed especially promising since they are all working on significantly different projects but recognise the need for deeper inter-connectivity. 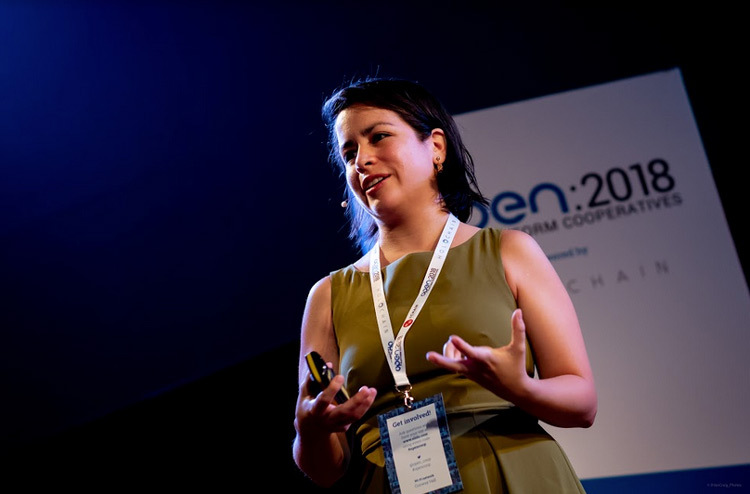 Growing the co-op economy – incubators, equity and tokens. As part of his excellent introduction explaining some of the history of cooperative ownership, Nathan Schneider questioned where our movement sits relative to the mainstream, for-profit startup world. The development of platform co-ops and member owned businesses are certainly disruptive in comparison to the standard VC model of business growth but not necessarily in the same way as we have come to use the term. If we are going to succeed we need to grow the number and size and reach of cooperative businesses and the movement has clearly recognised this by founding a number of cooperative incubator projects to help provide funding and startup support to aspiring platform co-ops and businesses: Platform6 (see the open space video explaining this new platform), start.coop, incubator.coop, Solidfund (which provided bursaries to help people get to OPEN 2018 for free), CoopStarter, UnFound (from our friends at the excellent STIR mag) and more. Hopefully this will provide fertile ground for more cooperative seeds to flourish. 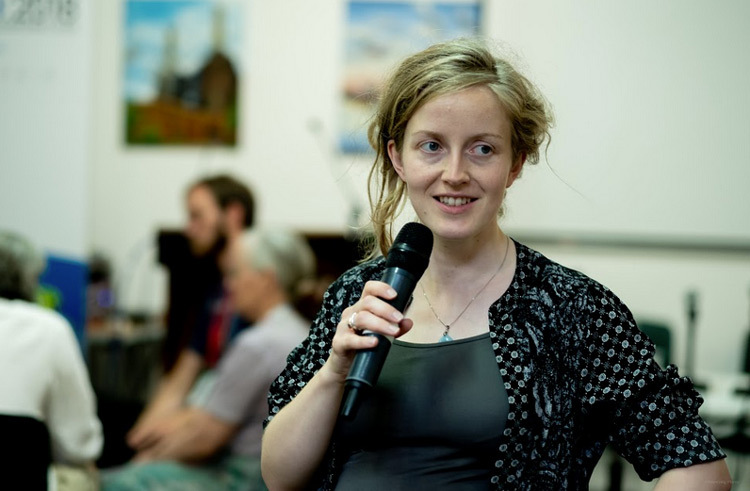 Emma McGuirk, a social anthropologist from New Zealand, offered some really interesting perspectives on timebanking including how they often die out – and are often perceived to have failed – when in reality the people they initially connected often become friends who start doing favours for each other, and hence no longer need a timebank. Michael Linton, designer of LETSystem presented his ideas about “circular money” and how this could facilitate a new economy. 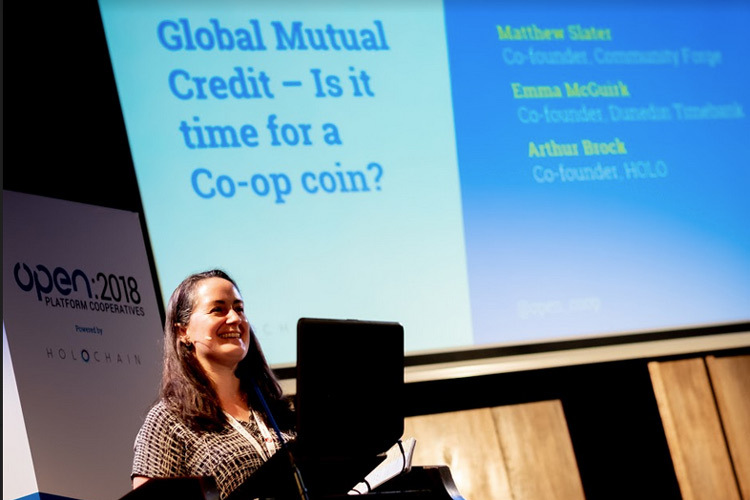 Matthew Slater, Co-Founder of Community Forge polled the room to ascertain interest in establishing an ethical credit exchange in the UK, and sources of seed-funding for this… which delivered some interesting results. If your organisation would be be interested in finding out more about trading via mutual credit please contact us for an update on the latest developments. Francesca Pick, Co-founder of Greaterthan & OuiShare Fest, led a deep-dive into people’s personal relationship with money. 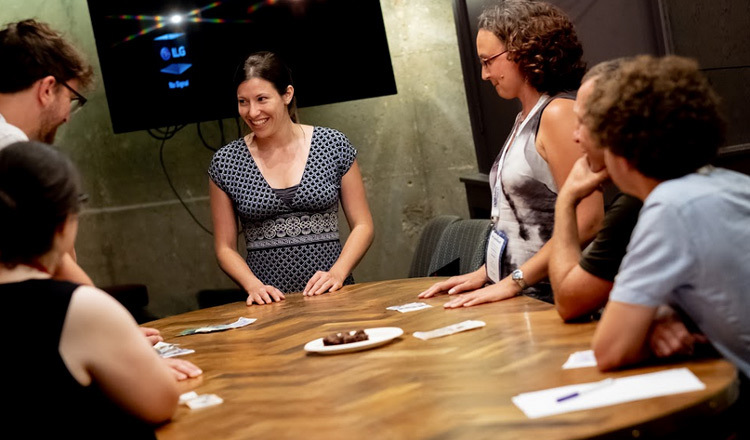 The Money Game was invented by the Findhorn Community in the highlands of Scotland and has been played around the world as a way to help people think about and deconstruct their relationship with money. 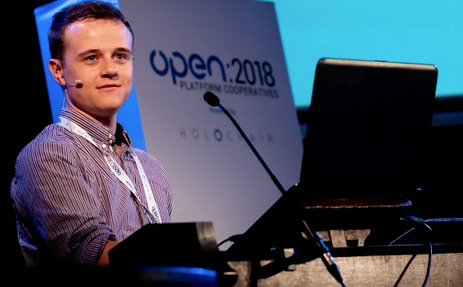 Since OPEN 2018 several organisations have approached us that are working on the Tokens concepts including the intriguingly named Co-opCoin – A decentralized Asset-Based Token platform which “helps to create and manage non-fungible ERC Tokens (Asset-Based Tokens, similar to a Security Token) representing real-world assets in a legally binding way.” Their ideas seem to offer one solution to the “capital conundrum”, which dovetail with our musings from last year about a possible co-op coin and we’ll report more on this as things develop. Matthew Brown, Cabinet Member for Social Justice, Inclusion and Policy at Preston City Council discussed the latest advances and successes of “the Preston model” which works to keep money circulating in a local economy, delivering huge benefits for both the people and organisations in the community. 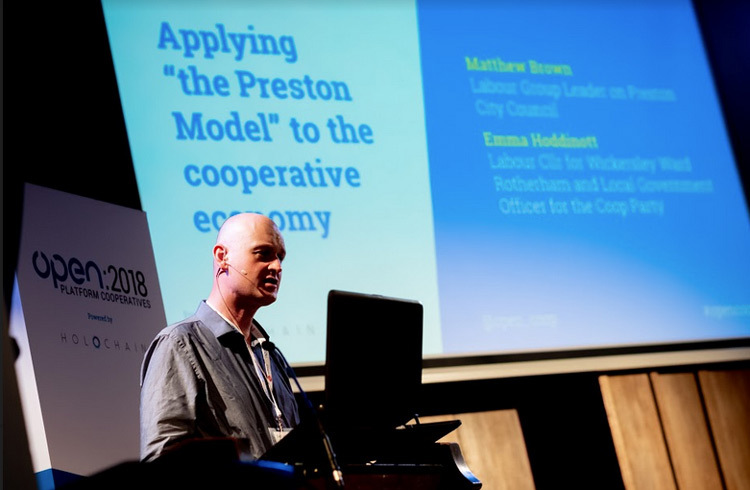 Emma Hoddinott, Labour Cllr for Wickersley Ward Rotherham and Local Government Officer for the Coop Party gave OPEN 2018 her thoughts on “the Preston model” and how other local government strategies could be deployed to create a thriving cooperative economy across the UK. In parallel to trying to figure out a more unifying politics OPEN 2018 got hands on with the tech, and we’re proud to have brought together people from CoTech, the Free Knowledge Institute, happy-dev.fr and others from the Open App Ecosystem Loomio Group, many of whom had never met before. 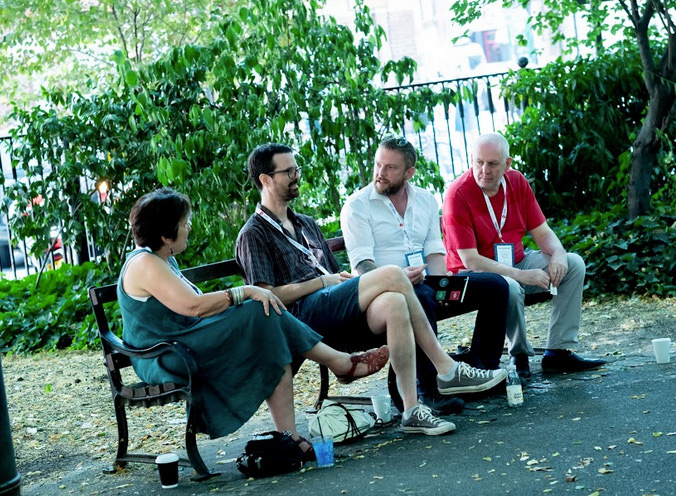 The discussions span out from the working and open space sessions into Red Lion Square outside the venue and involved several other groups who are interested in developing a suite of open source, cooperatively owned and managed tools to rival Google and Apple; a shared technical infrastructure to enable co-operators to move away from the standard data harvesting monopolies. In 2007, Art Brock (above) and Eric Harris-Braun formed the MetaCurrency Project in order to apply insights from nature to the design of software and social patterns, so that we can enable the next economy — one that is distributed, equitable, and regenerative. 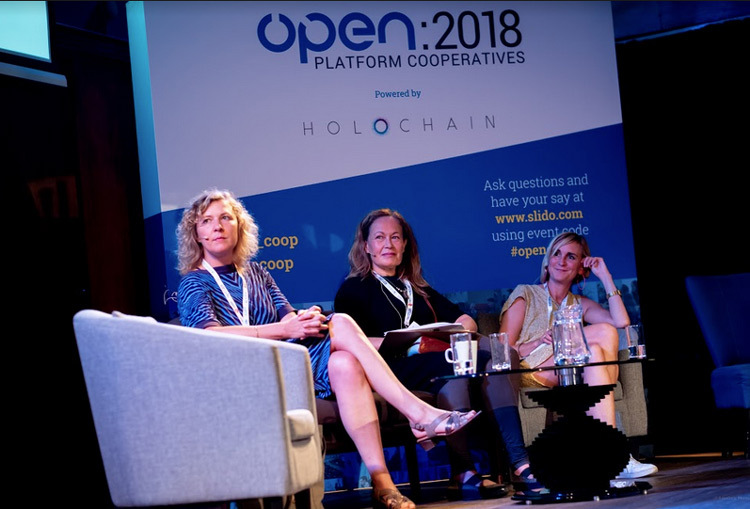 At OPEN 2018 Art ran a very well attended 1.5 day session on building apps on Holochain and the Holo project. The Square Pig provided the venue for a Holochain introduction and exploration into how this new, mutual-credit-based, peer-to-peer, app hosting framework, paves the way for an entirely new, agent-centric design for the decentralised web. 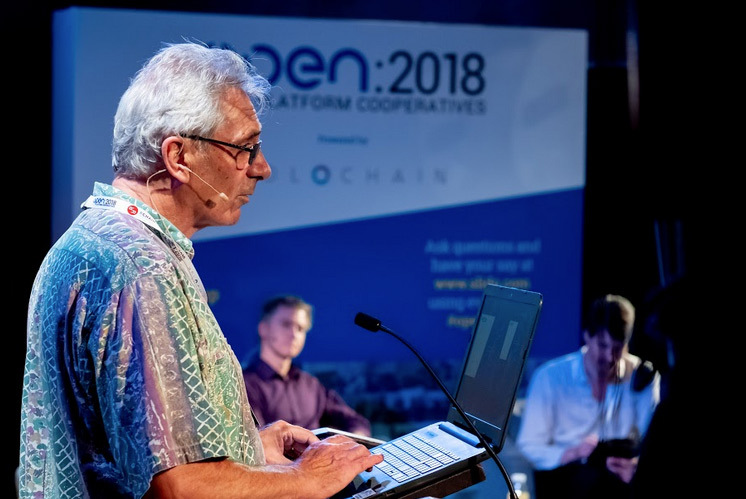 Our discussions with Art Brock since the event have confirmed Holo as a definite ‘one-to-watch’, alongside Rchain who, as a co-op, are also offering a fundamentally more progressive approach to creating distributed systems than pretty much every other “crypto” / ICO project we’ve seen. Stay tuned for more on both of these. 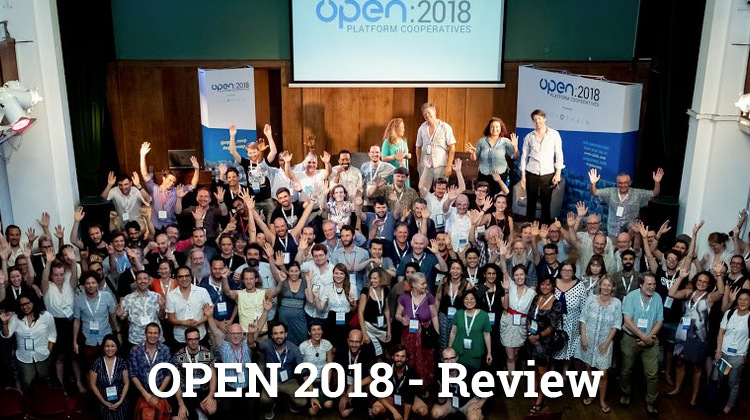 OPEN 2018 is not just about platform co-ops. It’s about the ownership revolution and forging a path to a collaborative, sustainable economy. It’s about creating new organisations which are member owned and democratically governed so that we, the people, have control over the institutions we rely on. What I’ve realised since the event is that a lot of people really agree with that objective – but a lot more have no idea what I am on about. So, I want to try and explain a few of the basic ideas and objectives of The Open Co-op and a few of the concepts and technologies which we are working on in order to create the world we want. Why are you doing all this? 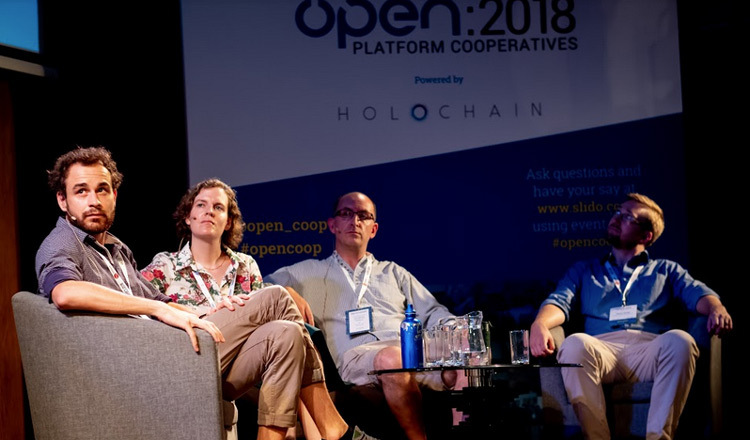 What is The Open Co-op and OPEN 2018 all about? We’re seriously worried about the state of the world and its fundamental, systemic problems. We recognise that humanity faces a multitude of inter-related issues such as climate change, inequality, poverty, species extinction and environmental destruction and are trying to encourage systemic solutions. We are trying to encourage fundamental systems change in the inter-related fields of ownership, governance and economics *at the same time*, because none of these can be “fixed” without addressing the others. We believe that open source, decentralised technologies provide some of the best tools available to disrupt the present corrosive systems. Our present systems of governance and economics are built on out-dated and exploitative protocols (official procedures and rules) which benefit the ‘haves’ more than the ‘have nots’ and pay no credence to planetary or environmental limits whatsoever. Money itself is just another ‘protocol’. 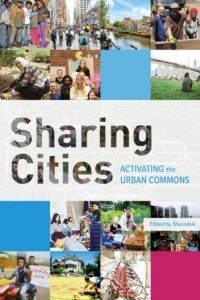 So we advocate the development of new, inclusive, open and fair protocols which define the rules of a new, collaborative and inclusive economy. Software, especially the kind used to run platforms, where people interact and trade, often ‘encodes’ specific protocols (e.g. who can do things, who owns things and who gets charged etc) so we see the development of new software as essential to our mission. We’re trying to layer the cooperative principles on top of the development of the decentralised web. We see this as the best possible route to a truly democratic and inclusive economy. If you’re not sure exactly what it is and why it’s important read this Guardian intro to the decentralised web, and then imagine that the majority of organisations transacting there are cooperatives, of which anyone can become a member, and you should get an idea of where we’re trying to get to. The purpose of The Open Co-op, defined at our outset in 2004, is: To build a worldwide community of individuals and organisations who are committed to creating a collaborative sustainable economy. 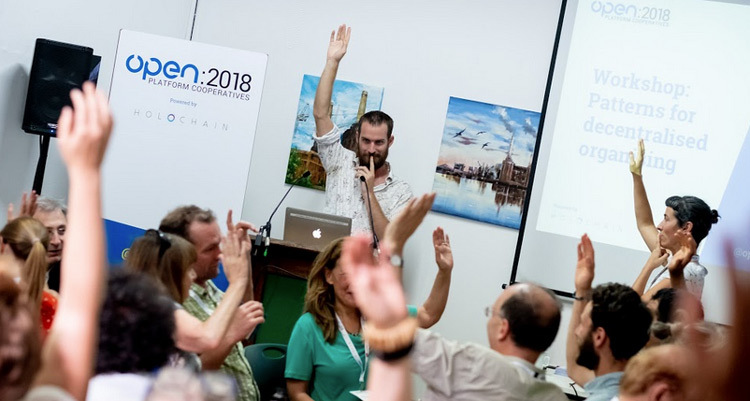 OPEN 2018 was our second attempt to bring people together into one place with the specific objective of growing and strengthening that community, and to discuss the ideas outlined above. Where is all this heading? What do you hope to achieve? Our vision is of a world in which people and planet come before profit. It’s a vision of a generative economy supporting a world of abundance in which common resources are ethically and equitably stewarded for the benefit of all. I asked people at the event if they had a better definition of our collective vision and was surprised and encouraged by the overall enthusiasm and unity behind a “a world in which people and planet come before profit”. But I worry that people struggle to identify with “a world of abundance in which common resources are ethically and equitably stewarded for the benefit of all.” We’ve all been born into a world with a shared ontology based on the ideas of scarcity and competition, which is why part of our work, and discussions at OPEN 2018 focuses on “the changing narrative”. We want to encourage a new ontological framework, a new world-view, in which the ideas of equity and abundance are as common as capitalism is pervasive today. In his article on “Why today’s internet is broken — and how we can do better next time around“, Ethereum co-founder Gavin Wood explains how, as the global economy went online, we replicated the same social structures that we had before. The same ontology and the same capitalist thinking was used to create privately owned, un-democratic, monopolies as we had in the real world. But the internet doesn’t have to work like that. It could be designed as a decentralised, cooperatively owned, democratic and inclusive system which works for the benefit of all people, not against them. 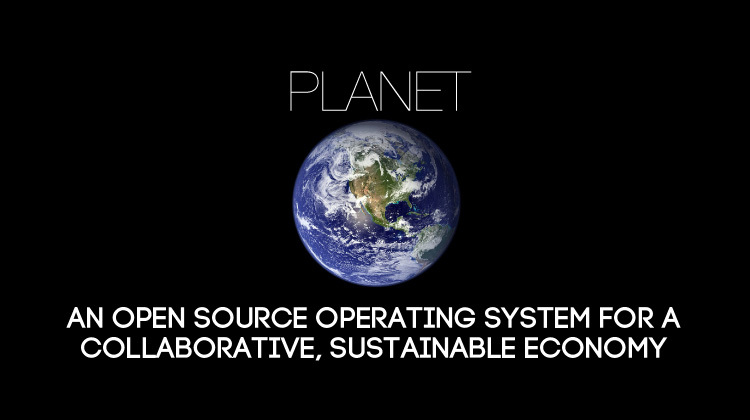 Our best attempt to outline what this world might look like is encapsulated in PLANET – our vision for an open source operating system for your mobile phone. Since people are used to navigating the world through their phones we’ve attempted to outline our vision through a Graphical User Interface (GUI) to give an idea of what it might be like to live in a world in which “we, the people, have control over the institutions we rely on”. If we could make one thing happen we would love see PLANET, or a system like it, become a reality. PLANET incorporates all of the elements of democratic, member-owned, governance and economics that we hope to see become reality. It is a conceptual vision of a system built on fundamentally different protocols, designed specifically to encourage a world of abundance in which common resources are ethically and equitably stewarded for the benefit of all. If you’re trying to encourage fundamental systems change in the inter-related fields of ownership, governance and economics at the same time, it’s never going to be easy. We attempted to address the challenge by curating a highly specific series of presentations and debates from experts in various fields. In retrospect, what we learned at OPEN 2018, is that the people who can and will make the system change are coming from many different perspectives. And many of the voices that should have been represented, those from marginalised and un-represented communities, were not. People need time to meet each other face-to-face and talk. Coming together, in the real world, is what this is all about after all – and we should probably have allowed more time for that than prescriptive sessions. The value that is generated through spontaneous meetings and group work was not liberated as well as it could have been by pre-organising the open space sessions. I also hogged the mic way too much – and would have enjoyed being involved in other open space groups as much as the audience would have no doubt enjoyed hearing from another voice on stage. 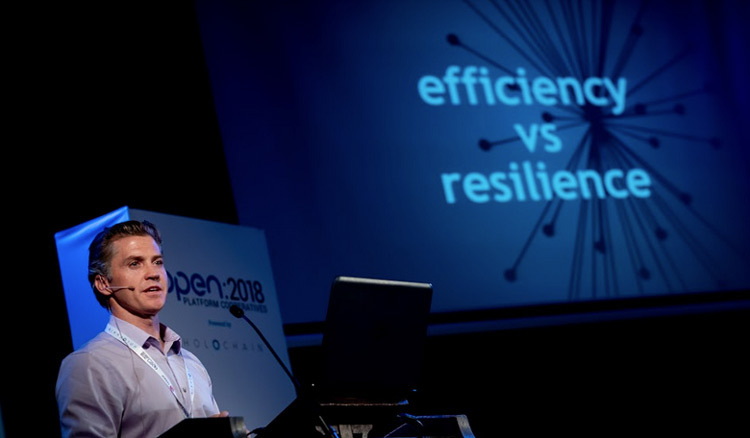 But, that said, we have had amazing feedback about OPEN 2018 – on average people rated the event 8.5 out of 10, and 90% of people said they learned something at OPEN 2018 which will allow them to improve their business / projects, so we don’t feel like we did a terrible job! If you attended and have not left feedback please do so here. As promised you can find all the notes from the sessions online – and also the list of questions that were asked on Slido – some of them did not get answered but, they paint an interesting picture of the thoughts in the room, and if you really want an answer to any particularly burning questions just let us know and we will do our best to help. There’s also this interesting little snap shot of the most popular questions. We will continue to plan and plot and progress our key projects and would love it if you want to collaborate on any of these. 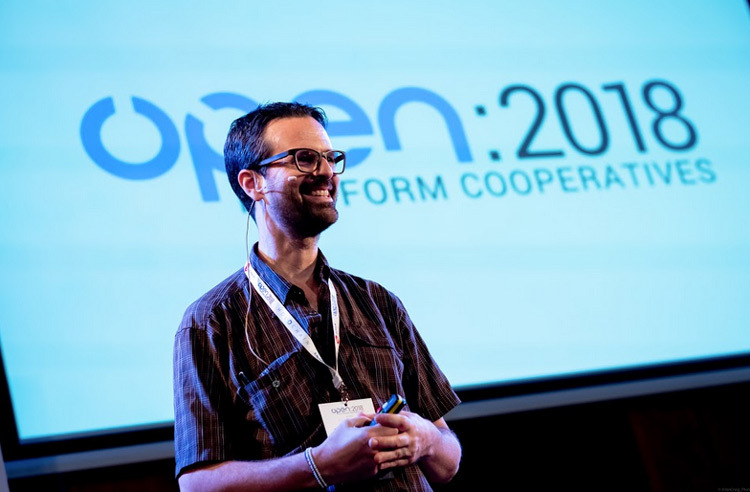 There are some other great write-ups about OPEN 2018 on Coop News. 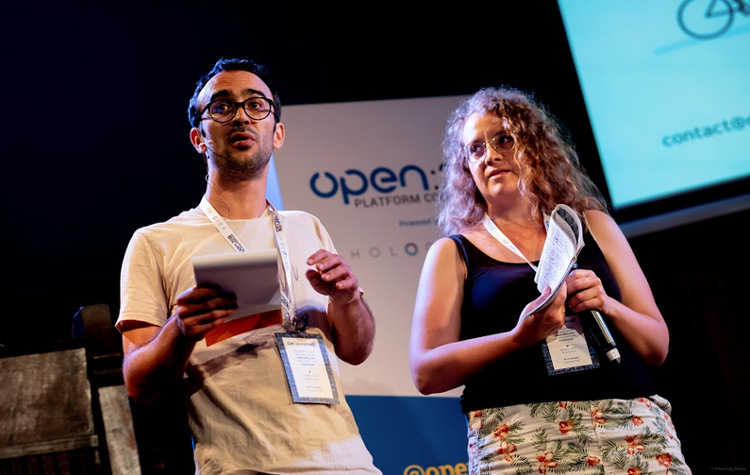 We will be thinking hard about the lessons we learned at OPEN 2018 and working out how best to put them into practice for OPEN 2019 which promises to be a very different and hopefully even more inspiring and impact-full event. 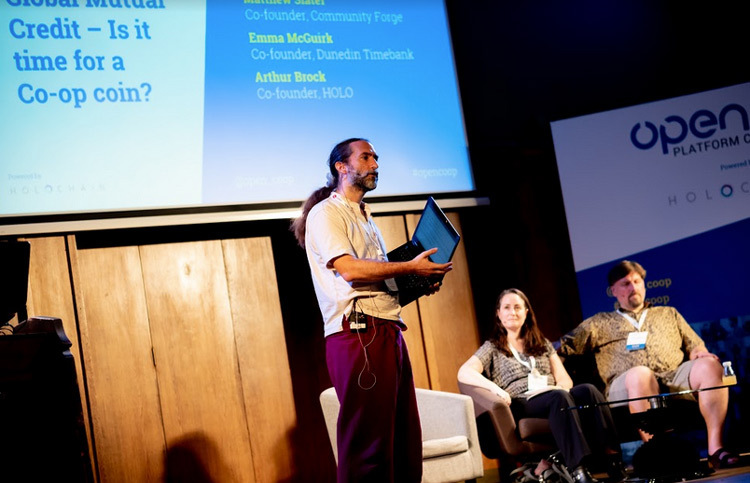 Thank you to everyone who came, supported, sponsored, exhibited, facilitated, chaired, volunteered, spoke and listened – you were all amazing, especially Thomas Heiser from Focalpoint.events, without whom OPEN 2018 would not have been possible. All photos are by Jon Craig. 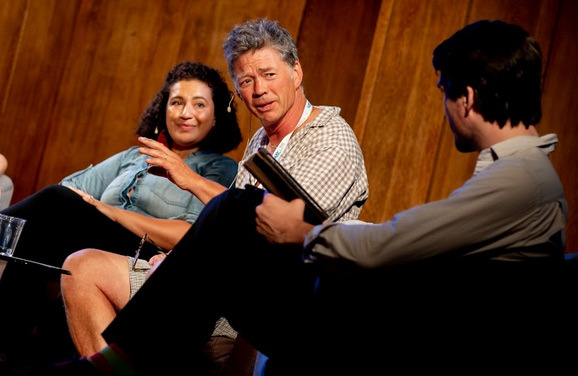 In our final session at the end of Day 2, Niki Okuk, the Founder of Rco Tires and Guy Watson, the Founder and Chair of Riverford Organic discussed ideas to challenge the dominant model of capitalist business and the de facto pyramid structure of management in order to enable a more equitable society. We heard how Guy is handing over Riverford to the employees – having resisted the best efforts of the VCs – and how Nikki has built a thriving, carbon positive business which is owned by its members. 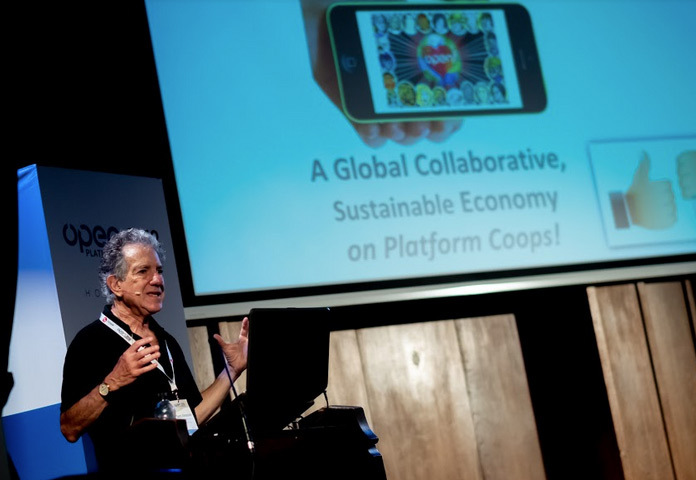 Despite coming from very different backgrounds and working in distinctly different sectors and geographies, both speakers had arrived at the same less-capitalist, more cooperative conclusions – They are the proof that a more ethical, more equitable economy is not only possible, but is on its way.